Smiths Medical, a leading global medical device manufacturer, will introduce three innovative new products for anesthesiologists at the upcoming American Society of Regional Anesthesia and Pain Management Medicine annual meeting in New York on April 19-21. • New EchoGlo® Peripheral Nerve Block (PNB) Needles and Catheters are visible under ultrasound at any angle or orientation and help aid catheter placement for accurate PNB procedures. When accompanied with CADD® infusion pumps and Portex® pain management products, Smiths Medical offers a full suite of products to perform continuous Nerve Block procedures. • CADD® Infusion Systems with NRFit™ Connector (left) comply with the ISO 80369-6 neuraxial standard that helps prevent misconnections between epidural and IV lines. The new non-Luer connectors are easily distinguishable with their yellow color and 20% smaller size. 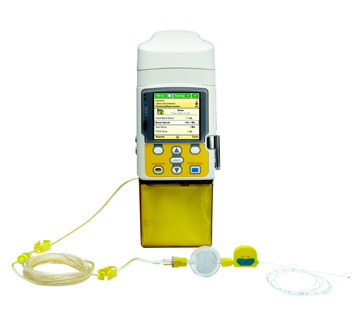 • CADD®-Solis Ambulatory Infusion Pump now includes wireless communication to and from PharmGuard® Server software, allowing clinicians to securely deploy software updates, remotely manage pump performance, track pump locations, and download infusion data reports to enhance medication safety and continuous quality improvement. These new products will be added to the Smiths Medical portfolio of well-recognized and trusted devices that regional anesthesiologists use through all phases of their patients’ care, including CADD®, Jelco®, BCI®, Deltec®, Level 1®, Medex®, Medfusion®, Graseby™, Pneupac®, and Portex®. Visit Smiths Medical booth #513 at ASRA to learn more. Smiths Medical www.smiths-medical.com is a leading supplier of specialized medical devices and equipment for global markets, focusing on the medication delivery, vital care and safety devices market segments. It is part of Smiths Group www.smiths.com, a global leader in applying advanced technologies for markets in threat and contraband detection, energy, medical devices, communications and engineered components. Smiths Group employs around 22,000 people in more than 50 countries.